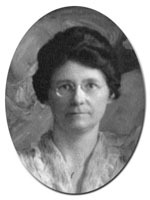 Nancy McNeal Roman came Cornell in 1917 as an instructor in home furnishings and administrator of the 4-H program. She had received a bachelor's degree in home economics from the University of Chicago in 1916 and an M.A. in Education from Columbia University in 1927. Before Cornell, Roman taught grade school and high school in Kentucky and Florida, and served as principal of two grade schools. She was also an instructor in home economics and education at the University of Chicago from 1914 to 1917. In 1925, Roman became an extension professor in the College of Home Economics. She traveled across the United States and Europe studying progressive school systems and general educational methods. As part of her extension work, she wrote pamphlets designed to help homemakers furnish their homes inexpensively and attractively, such as Old Chairs with New Seats and New Desks from Old. Beginning in 1946, when Roman was appointed resident professor of housing and design, she taught classes on furniture making, painting, fabric purchasing, and simple home construction. Roman said her goal in teaching was to prepare her students for the problems they would face in decorating their first homes. She was also interested in the connection between furnishings and home management and family relations. After her retirement, Roman traveled extensively.